UNISON Edinburgh’s latest cuts newssheet outlines how the cuts will affect you as a worker and you and your family as citizens. No plan to deal with the increasing workloads and stress. Outsourcing a further 25% of home care work to lower pay providers. Reducing wages in disability services whilst acknowledging poor recruitment/ retention levels. 27% reduction in management and 15% reduction of frontline staff. Outsource, possibly via a co-operative, over 1,000 care staff in home care, care homes, day care, disability services, occupational therapy, equipment and telecare. All designed to reduce costs and eventually, pay and conditions. Instead of increasing income the environment section are ending commercial waste collection and recycling. Making the school crossing patrol post unsustainable by reducing hours. Change some venue workers to 5 day contracts including every weekend. Allowing the most vulnerable to be cared for by lower paid, low morale, high turnover, and overworked staff. Reductions in parenting support for vulnerable families and family/pupil support to reduce exclusions. Reduce youth work and adult learning. Reduction and closure of some libraries. Reduction in safer and stronger communities spend. School music service to be charged. Withdrawal of night noise team. Withdrawal of community equipment to all except critical needs. 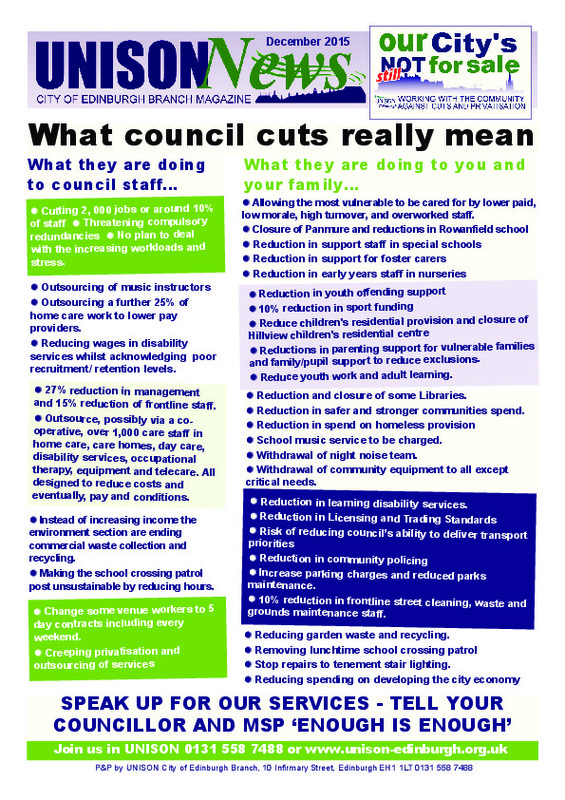 Reduction in learning disability services. Increase parking charges and reduced parks maintenance. 10% reduction in frontline street cleaning, waste and grounds maintenance staff. Reducing garden waste and recycling. Stop repairs to tenement stair lighting.